The Sir Christopher Wren Building at William & Mary is the oldest college building still standing in the United States and the oldest of the restored public buildings in Williamsburg. It was constructed between 1695 and 1700, before Williamsburg was founded, when the capital of the colony of Virginia was still located at Jamestown, and the tract of land between the James and York rivers which was to become Williamsburg was populated by crude timber buildings and known as "Middle Plantation." The Wren Building has been gutted by fire three times — in 1705, 1859 and 1862. Each time the interior of the structure was rebuilt, and for more than three centuries, it has been "the soul of the College." In the building, generations of William & Mary students have attended classes and lectures, enjoyed meals and attended chapel services. Classes are still held in the Wren Building, which also is home to several faculty offices. To prepare the Wren Building for its fourth century of use, the university completed a comprehensive renewal and replacement project in 1999-2000. The major components of the project were restoration of the architectural features such as floors and paneling; replacement of mechanical systems; safety upgrades; and repair and stabilization of the walls and foundation. Interest in founding a college in Virginia was expressed as early as 1619, when the Virginia Company of London undertook to establish a "university" at Henrico on the James River about twelve miles below the present city of Richmond. The Indian uprising of 1622 and the revocation of the Virginia Company charter in 1624 caused this initial attempt to be abandoned. In 1691 the Reverend James Blair, the commissary – or representative – of the Church of England in Virginia, was sent to London by the General Assembly to secure a charter for a college. He was successful, and on February 8, 1693, King William III and Queen Mary II granted a charter which established "a certain Place of universal Study, a perpetual College of Divinity, Philosophy, Languages, and other good Arts and Sciences, consisting of one President, six Masters or Professors, and an hundred Scholars more or less." The new college bore its patrons' names, and the charter designated Blair as the first president and provided an endowment to support the institution. The college was to consist of three schools: a grammar school for boys about twelve to fifteen years of age; the philosophy school, in which students would pursue advanced study of moral philosophy (logic, rhetoric, ethics) and natural philosophy (physics, metaphysics, and mathematics); and the divinity school, where young men who had completed their studies in the philosophy school could be prepared for ordination in the Church of England. About 330 acres of land were purchased in December 1693, and the first bricks for the main building were laid in 1695. By 1700 the east and north wings of what was planned to be a quadrangular structure had been essentially completed. This first college building housed students and contained classrooms, a dining room, a library, a faculty room, and living quarters for the president and masters; a kitchen and servants' rooms were located in the basement. Known simply as "the College," the main building was renamed in 1931 for the famous English architect, Sir Christopher Wren, to whom an eighteenth-century author attributed the design. 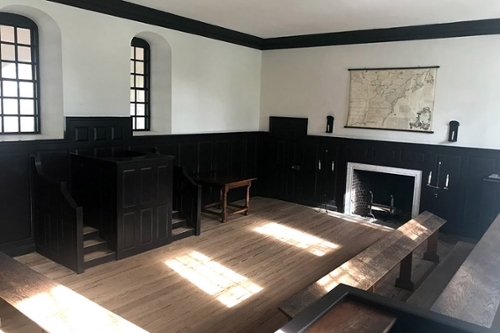 In 1699 the colonial capital was moved from Jamestown to the newly formed city of Williamsburg, and the Wren Building, then the largest structure in the area, became the temporary headquarters of the government from 1700 until 1704, when the Capitol was completed. 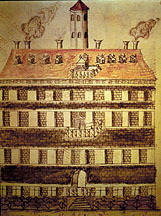 The Wren Building was gutted by fire in 1705 and was rebuilt by 1716 with funds provided by Queen Anne of England. This second form of the building — the one upon which the restoration of 1928 was based — differed in many ways from the original structure, although it was erected on the original foundations, using much of the original walls. In 1732 construction of the Chapel, or south wing, was finished. Plans for the completion of the quadrangle were made around 1772, and Thomas Jefferson prepared a floor plan of the building showing the proposed addition. The Revolutionary War intervened, however, and construction of the fourth wing was suspended after the foundations were laid, never to be completed. The Wren Building burned again in 1859, and the old walls were once more incorporated into the reconstruction. A third fire ravaged the building in 1862 when Union soldiers quartered in Williamsburg set fire to it. From 1928–31, the Wren was restored to its colonial appearance as part of the Rockefeller restoration of Williamsburg. Today, as the Wren Building enters its fourth century, it continues to be used as an academic building, housing faculty offices on the third floor and classrooms throughout the building.